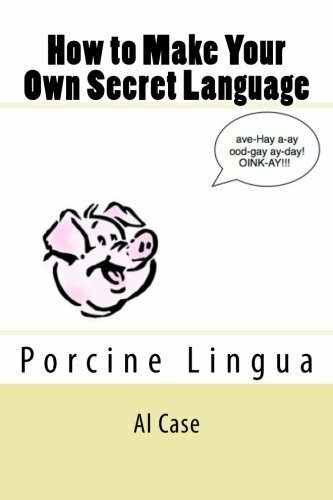 How to Make Your Own Secret Language offers detailed instructions for a number of 'Pig Latins.' When children get this book they become enthralled, and spend hours and hours reading it, trying it out, twisting their tongue into knots and laughing hysterically, and something crazy happens: they start to play with language. Wouldn't you like your child to learn languages, to become proficient at language, as they do with the latest video game? This book, 'How to Make Your Own Secret Language,' is the key to a child who plays with words, and the masters language skills. Heck, English becomes a toy, and even foreign languages become MUCH easier to learn! Includes detailed instructions for the following languages. Pig Latin Double Dutch Gibberish Ak Backslang Doble Dop Ubbi Dubbi Arpy Darpy Oben Globish Gobbledygook BTW, maybe it's time for a few of you adults out there to start having some fun, too. Eh? If you don't your kids will end up being smarter than you! About the Author: Al Case has been writing since 1967. He wrote for the martial arts magazines beginning in 1981, and had his own column in Inside Karate. He is a published poet, has written books on algebra and poetry, and has over 40 books on Amazon/Kindle.